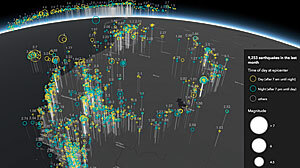 ArcGIS Arcade—an expression language used to evaluate and return data values in pop-ups, labels, and data-driven visualizations securely across the ArcGIS platform—gives you flexibility in the development process without requiring that you make changes to the feature layer. It’s a good start, though. An Arcade expression was used to generate time-of-day visualizations of real-time earthquake data from the US Geological Survey that spans multiple time zones. It is symbolized by the time of day at each earthquake’s epicenter. Similar in syntax and simplicity to spreadsheet formulas, Arcade is a powerful tool that lets you display and visualize information beyond what is immediately available in a dataset by visualizing and displaying new data values. These data values are calculated on the client side and can be formatted the way you want even if you don’t own the layers containing the data. 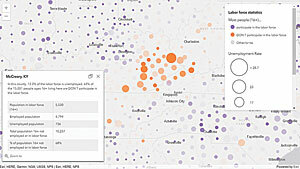 This web map uses Arcade to visualize the relative predominance of each political party in each US county based on the party with the largest number of registered voters in that county. If you’ve been putting off getting started with Arcade, a few minutes reviewing the following examples will show you how Arcade can be useful for some common scenarios. Most geospatial data visualizations use normalization. In normalization, one numeric attribute value is divided by another to minimize the influence of differences in the size of areas or the number of features in each area. For example, if I want to visualize the population for whom a second language is spoken at home for each census tract in the United States, I can use Arcade to perform the normalization using the following expression. Arcade is especially useful for accomplishing this if I don’t own the dataset. Since this expression executes on the client, no changes to the service are necessary, and all processing happens at runtime. Note that the previous expression didn’t specify the precision of the returned value, so it may return values containing more significant digits than desired. Modifying the expression using Round, an out-of-the-box Arcade function, will round the value to the nearest tenth. One of the frustrations users have with some datasets is that the data isn’t represented properly: numbers stored as strings, strings that aren’t formatted, dates that are broken up and stored in multiple fields, and yes and no values that are stored as ones and zeros. Fortunately, Arcade has Text(), Number(), Date(), and Boolean() functions that (conveniently) let you cast field values as the desired type. If you have values that have been stored as the incorrect type, you can cast those values as the correct value type so they can be properly visualized as shown in the examples in Listing 1. Arcade contains six functions intended to simplify the syntax for logically evaluating values. While the syntax in Listing 2 is correct, it takes several lines of code to determine if a score is high or low based on a field value. Arcade conveniently simplifies this common workflow with the IIF() function, which reduces seven to eight lines of code down to just one. The same evaluation in Listing 2 is shown in Listing 3. Be sure to check out When(), Decode(), and the other useful logical functions in the Arcade documentation. Arcade is designed to be lightweight and simple. Once you’re familiar with the syntax, you can write powerful expressions in just one or two lines. However, you can also write longer, more complicated expressions in Arcade that can include custom functions and even geometry operations. 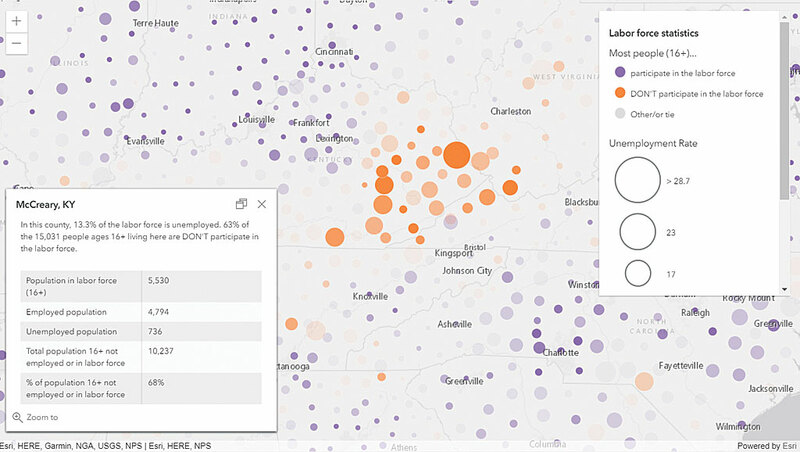 In this web map, an Arcade expression visualizes statistics for participation in the labor force based on predominance (do or do not participate) and rate. While Arcade gives you unprecedented flexibility in customizing layer styles and pop-ups, even layers owned by others, it shouldn’t be used in every case even if it is permitted. If you have full ownership of a layer containing the data you want to visualize in a web app and that data is already stored in a clean, acceptable way, you don’t need to write Arcade expressions. You can store values used for the data-driven visualization, pop-ups, and labels in service fields, so there is no need to write Arcade expressions for formatting or casting values. The examples in this article use Arcade for normalizing, rounding, and casting when you don’t have privileges for the dataset you want to use and need a quick way to modify field values. It’s also important to keep in mind that not every function included in the Arcade language should be used in all available profiles or contexts for which they can be used. Arcade provides 32 geometry functions and, in theory, any of them could be used in any profile: visualization, labeling, or pop-ups. However, remember that Arcade executes on a feature-by-feature basis, so executing multiple geometry operations for each feature may not provide an optimal user experience if used in visualization and labeling profiles. It may be more appropriate to reserve more complex expressions using multiple geometric operations for the pop-up profile, because with that profile, the expression will execute only when a feature is clicked. The December 2017 release of Arcade (version 1.3) introduced more than two dozen geometry functions that include measurement operations, overlay operations, and topological testing functions. Many geometry functions, such as the overlay and testing functions, require more than one input geometry. In the current release of Arcade, you can manually construct geometry objects as needed within the expression, such as calculating the distance from one hard-coded point to all points in a layer. Future releases will provide methods that allow you to access other geometries within the same layer, related tables, and features in other layers. Additional functionality will continually be added to Arcade, but you can take advantage of the out-of-the-box functions right now. You can also go outside the box by writing your own functions.